Justice and public participation in universal health coverage: when is tiered coverage unfair and who should decide? Universal health coverage is often implemented within countries through several national insurance schemes that collectively cover their populations. Yet the extent of services and benefits available can vary substantially between different schemes. This paper argues that these variations in coverage comprise tiering and then reviews different accounts of health and social justice that consider whether and when a tiered health system is fair. Using these accounts, it shows that the fairness of tiering can be determined by assessing whether differences in coverage mean enrolees under some national insurance schemes do not achieve sufficient health or normal functioning and/or feel inferior relative to those belonging to other national insurance schemes. The paper further contends that these determinations of fairness should involve the people covered by different insurance schemes. Key universal health coverage questions to involve the public in answering are: Do the sum of differences between the schemes in your country generate feelings of unequal moral worth and/or mean enrolees struggle to achieve sufficient health or normal functioning? Which specific differences between health insurance schemes generate the greatest feelings of unequal moral worth in individuals? Which specific differences generate the greatest barriers to individuals achieving sufficient health or normal functioning? Rather than identifying which services to extend coverage to first, answering these questions will identify which disparities in services and benefits are the most morally urgent to address. Finally, some initial thoughts are offered on who from the public should be involved in making these decisions and how they might be involved as a matter of justice. 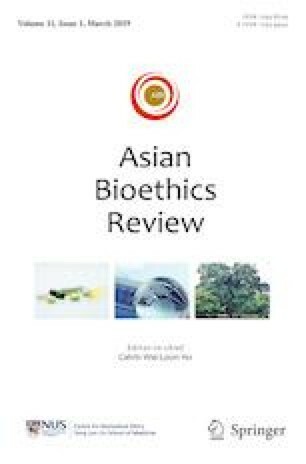 The author would like to thank the speakers and attendees of the ABR Research Conference on the Ethics of Universal Health Coverage, held at the National University of Singapore, 5–7 February 2018. Their insightful presentations and comments informed the thinking that is reflected in this paper. BP is currently supported by an Australian Research Council (ARC) Discovery Early Career Researcher Award (Award No. DE170100414). BP’s participation (travel and accommodation) in the ABR Research Conference on the Ethics of Universal Health Coverage was supported by the National University of Singapore. The contents of this article are solely the responsibility of the author and do not reflect the views of the ARC. Frenz, Patricia, and Jeanette Vega. 2010. Universal health coverage with equity: what we know, don’t know and need to know. http://www.healthsystemsresearch.org/hsr2010/images/stories/9coverage_with_equity.pdf. Accessed 21 May 2018. Ho, Calvin Wai Loon. 2013. The equity of universal health coverage: Some reflections from Singapore. Brookings Institute. https://www.brookings.edu/opinions/the-equity-of-universal-health-coverage-some-reflections-from-singapore. Accessed 21 May 2018. Muangpin, Mesinee, and Pratch Ruji. 2015. Solutions offered for inequality in state healthcare schemes. The Nation. http://www.nationmultimedia.com/national/Solutions-offered-for-inequality-in-state-healthca-30261650.html. Accessed 21 May 2018.